As awful as Obamacare has been at its purported goal of making health care affordable, it has been unquestionably successful at one of Obama's other primary goals: the redistribution of wealth. Unfortunately, the poor design of the redistribution function is one of the reasons Obamacare is failing. As the Economist points out, Obamacare imposes new taxes and costs on the middle class to fund subsidies for low-income earners. Low-income people get Obamacare for almost free, while middle class families are required to pay full freight for the most expensive government health care plan in the world by far. Progressive taxes and fees almost always cause a reduction in economic activity due to the incentive effect, but this effect can be minimized if the progressivity is intelligently, efficiently designed. Which Obamacare was clearly not. One of the basic rules of progressive income taxation is that you should never have marginal tax rates over 100% (or, realistically, anywhere near 100%). If you start taxing people over 100%, they quickly decide to stop earning. Obamacare contains an extreme violation of this rule. The Obamacare subsidy calculator from the Kaiser Family Foundation illustrates the cost of Obamacare at various income levels. 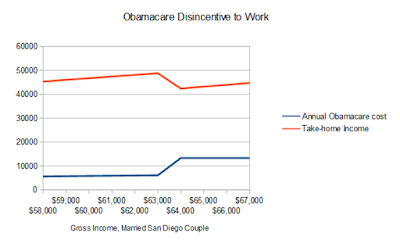 For a married couple in their 50's in San Diego, subsidized Obamacare costs range from $61 per month to $507 per month, while the unsubsidized have to pay $1107 per month, or more than $13,000 per year. That's a lot of money to a middle-income couple (and that's for the high-deductible "Silver" plan!). 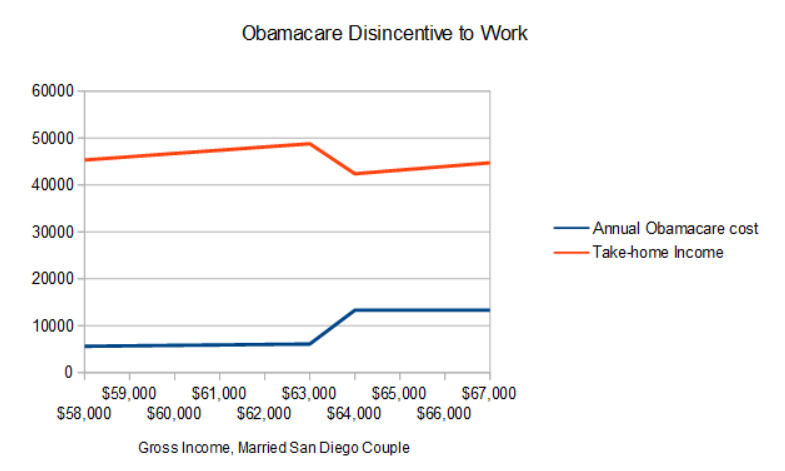 Looking at the data from running the KFF calculator at different income levels, we see that there is an "Obamacare Cliff" for our hypothetical San Diego couple. If they earn a combined $63,000, they have to pay only $507 per month for Obamacare. But if they earn $64,000, they have to pay $1107 per month, reducing their take-home pay by $6410 (considering state & federal taxes as well). That's a 741% marginal tax rate on that additional $1000 of income! Under Obamacare, this couple actually gets more take home pay if they earn $55,000 than they do if they earn $65,000! That's a strong incentive to cut back hours. Why work more hours if the government is going to take all your additional earnings? Take some time off, pick up a hobby! The income level at which the cliff happens will vary by family (the cliff happens at $98,000 for a family of four in Omaha, for example), but everyone has a cliff at some income level. Think this is just theoretical and nobody actually manages income around tax incentives? Don't be so sure. I first learned of the Obamacare Cliff from a friend whose neighbor is nearing retirement and managing his income precisely around the Obamacare Cliff. And any competent tax advisor will certainly be advising his clients near the cliff to do anything they can to stay on the right side. But that's not all. The cliff is likely to get even bigger with the huge Obamacare premium increases expected in 2017. This will not end well. UPDATE: Labor economist Casey Mulligan has written a whole book on the negative side effects of Obamacare costs and subsidies. How about the married couple in San Diego without insurance. To avoid the penalty and claim the affordability exemption, they need to be above 400% of the federal poverty level of $64K. If this uninsured couple is making $60k, would they rather pay 15% marginal taxes on $4k of fake income to get over 400% of the FPL than be subject to a 2.5% of total $60k income penalty? When have we had a tax code where you can save money on taxes by having more income?